Old-fashioned villages and picturesque riverside towns await, along with thriving cities like London, Birmingham, Manchester and Leeds. England has so much to offer and the best way to see it all is by boat. Visit the Shakespeare town of Statford-upon-Avon, historic Bath, or the River Thames with its royal attractions of Windsor and Hampton Court. Or just relax and enjoy spectacular scenery as you float peacefully along your chosen river or canal, where your only decision is which traditional pub to stop at for dinner! 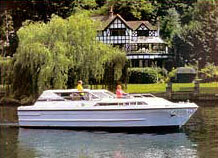 There is a wide choice of boats available for hire, including canal narrowboats, cruisers and yachts. Follow the links below to find out more. 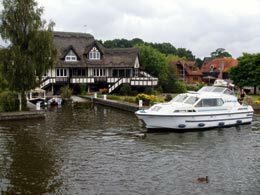 This historic waterway is a wonderful place for a boating holiday, with beautiful scenery and a wealth of attractions, including Hampton Court and Windsor. The traditional narrowboat of the UK canals provides a relaxing boating holiday, with attractive countryside, historic towns, and heritage sights. The locks, tunnels and aquaducts provide variety and interest for all the family. We offer the widest choice of canal narrowboats in the UK, available from over 50 boat hire bases in all areas. 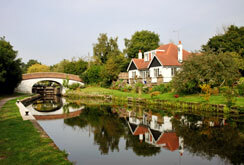 We offer independent advice to help you choose the perfect canal boat for your holiday.